Network Rail’s long term objective is to consolidate operation of approximately 2400 small signal boxes and operating centres into 12 main control rooms at strategic locations nationally. Three Bridges Rail Operating Centre covers the South of England. 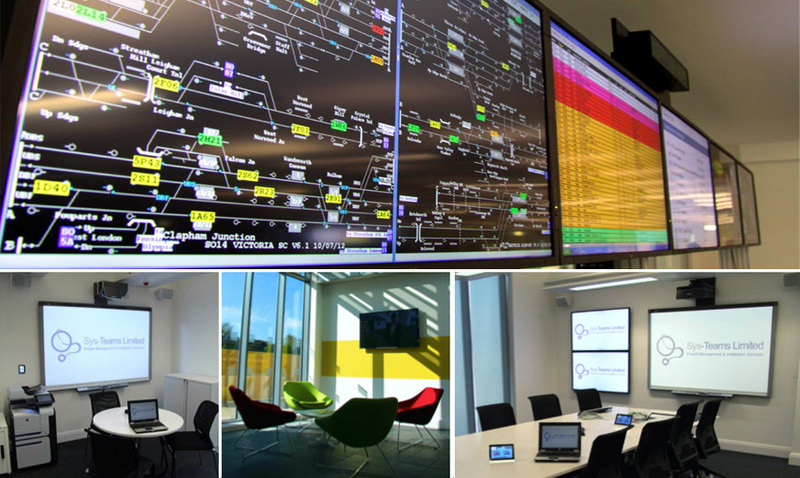 The Brief was to create a series of collaborative meeting spaces, incident rooms, banks of controllable screens within the Operations floor as well as providing a building wide IPTV system. The Installation was delivered on time, within budget and as per the specification. The collaborative meeting spaces consisted of Smart’s 885ix2 Intergrated Smartboards, controlled via an 4.3″ AMX colour touch panel and an AMX 2150 HD 6×3 All-in-One Presentation Switcher which took care of the Audio and Video switching of both Digital and Analogue laptop, host PC and Encoded Media’s IPTV inputs. The larger Incident rooms comprised of multiple NEC X551S LED displays as well as Smart’s 885ix2 Intergrated Smartboard. These rooms were controlled via 2 x table top AMX colour touch panels and an AMX 3150 HD 10×4 All-in-One Presentation Switcher which when accompanied by user friendly and intuitive programming allowed for an extremely versitile working environment.